Narendra Modi has retained the top slot since January, while Arvind Kejriwal and Rahul Gandhi are on the second and third spot, respectively. The big movement has happened for Chidambaram and Jagan Mohan Reddy. Chidambaram took the 4th place, replacing the Congress President Sonia Gandhi, while Jagan Mohan Reddy cruises from the 17th position in January to the 6th position in February. The biggest story of the month was Kejriwal quiting the Delhi CM post over the Jan Lokpal bill. Akhilesh Yadav, Rajnath Singh and Narendra Modi have become the most favored leaders, while Ajay Maken, Sheila Dixit and LK Advani are the least favored. 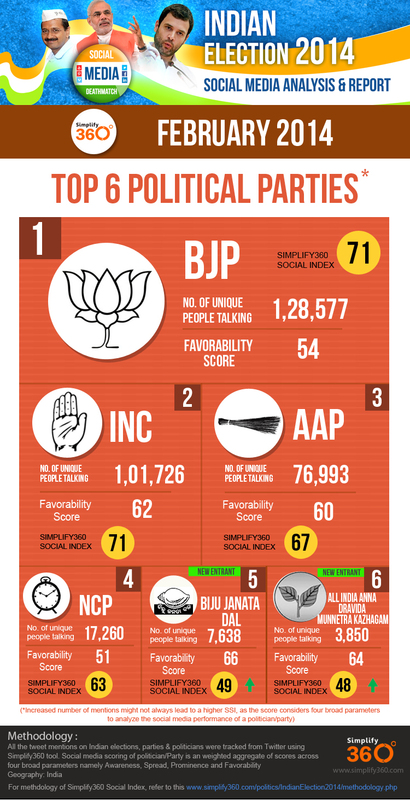 AAP and Kejriwal continue to fight the biggies in the online buzz and the party is still at No. 3, after BJP and INC. Interestingly, BJP has become one of three least favored parties in February while INC makes it to the top 3.